1. I love to read but sometimes I get a little ahead of myself. I have three library books on my nightstand. Want to know what they are? I would like to finish them all by the end of November so I can dedicate the month of December to reading books about running, specifically marathon running. I’m pretty sure I will need a little inspiration and motivation at that point. 2. The Disney Marathon is 75 days away. The website says, “the marathon course runs through all four Walt Disney World® Theme Parks starting at Epcot®, continuing on to the Magic Kingdom® Park, Disney’s Animal Kingdom® Park, Disney’s Hollywood Studios™ and then back to Epcot® for an exhilarating collapse finish.” Can’t wait! 3. Did you know that you should replace your running shoes every 300-500 miles. I just got a new pair. I keep the old pair for running in the rain or when it’s muddy or wet out since most of my running is on trails. This is my third pair of the same Nikes. 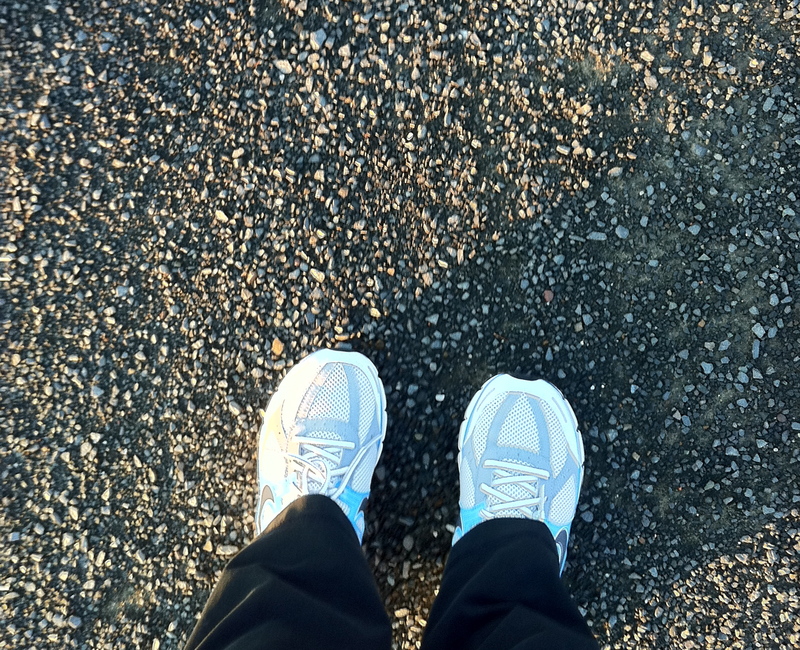 I went to a running store and they fit me for running shoes based on my gait and how I wore out my previous pair of sneakers. I zoomed in to get a photo so I was quite a distance away. 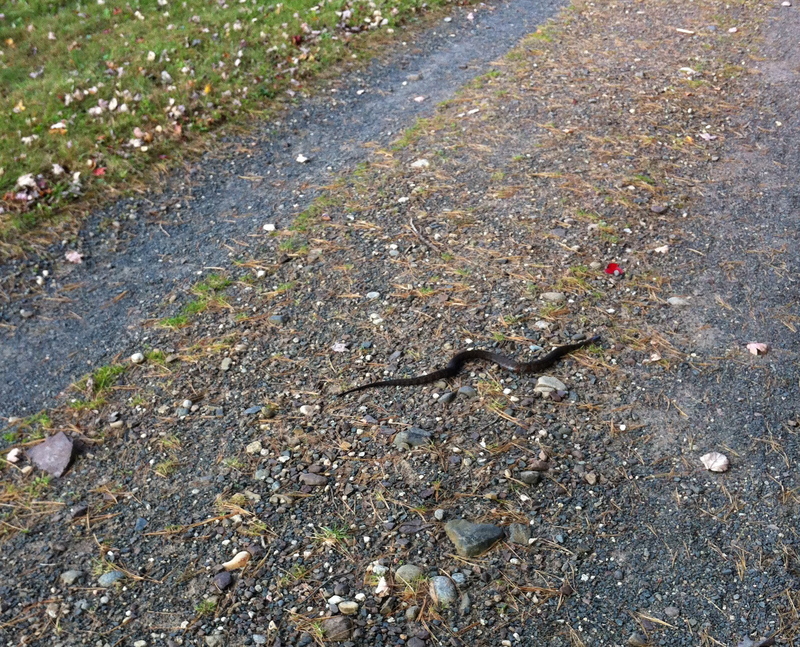 The snake scurried off into the woods. 5. I quit coffee! About a month ago I stopped drinking coffee. I really only drink it at work anyway. So I started bringing tea to work. I feel much less dehydrated after a night at work. I also don’t get a headache when I’m off for a couple of nights because my body is craving coffee. My favorites at the moment are the mineral tea I bought to aid in bone healing, Holiday Chai and Vanilla Cinnamon teas from Stash. A couple of years ago my sister spent a few weeks in India and brought me a box of Indian Vanilla Green Tea. I loved it so much I contacted the company in India and ordered 4 more boxes. I’m now down to my last box. Too bad I couldn’t visit India myself to replenish my supply. Hi Aimee! I don’t like snakes, black salamanders or any other similar varmint in my path. I also don’t like squirrels or raccoons in the garbage can. That just freaks me out! I like chai tea, but the mix kind with dried milk, creamer, and sugar etc…in it. If I’m drinking an unsweetened tea, it is Good Earth original, because that tea tastes naturally sweet. 3) Snoop: What your stuff says about you by Sam Gosling. How’s your running going? You’re right back on course, right? Oh Marion I am a total wimp around mice and rats. That snake had me looking out the entire run. Last year I was addicted to Good Earth’s Sweet and Spicy tea. I will have to check out their original tea. Thanks for listing some of your books. I have a long list going on Good Reads of books I want to read. The running is going great. I’m back on track and I hope to have a post up tomorrow to talk about where I’m at right now. I just got new running shoes as well. Mine had about 500 miles on them, because towards the end of their life, I started to wear them doing everything, not just running. Mine are Nikes as well, onto pair number 2. I read the 19th Wife. It was decent. I have a bad habit of eventually wearing my running sneakers everywhere too. It’s just more convenient I suppose, but I probably should have a casual pair of sneakers on hand too. Any books you would recommend? I have placed these books on hold at my library! Hi Lisa! Let me know what you think after you read them. I’m almost done with the Kathy Griffin biography. It is really funny and yet serious at times. She cracks me up. I am hoping to start The Nineteenth Wife tomorrow.